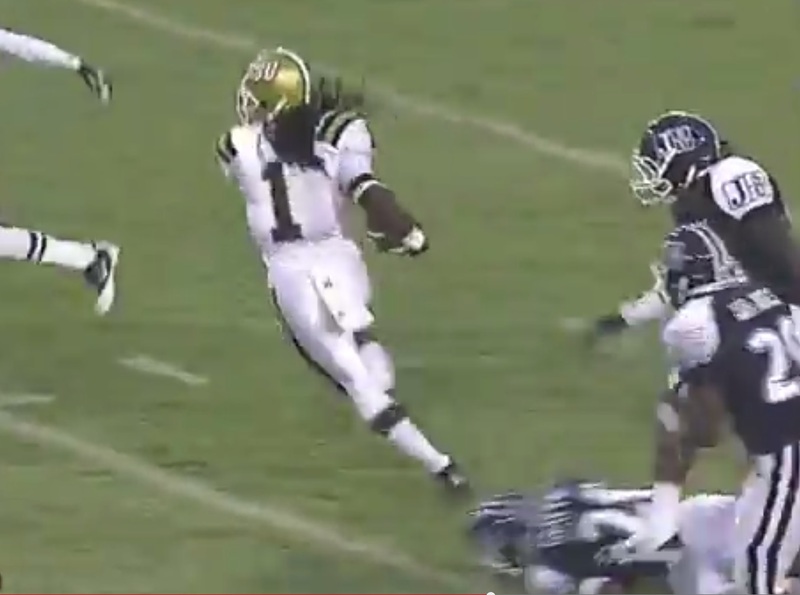 Based on talent only, Alabama State’s Isaiah Crowell is the best RB in this 2014 draft class. Talent isn’t everything. Watch an Alabama State football game and you’ll see a talented young man in a hurry. Isaiah Crowell has a sense of urgency that transcends the field of play. Every time the Hornets’ 5’11”, 215-lb. starting running back hits a crease or turns a corner with the ball in his hands, it feels like there’s more power in his legs than the hunger for another yard, another first down, or another touchdown. It feels as if Crowell had his way, he’d burst through the line of scrimmage, hit the sideline, disappear through the tunnel of the stadium on a Saturday, and with the assistance of a football time-portal (operating courtesy of high-end quantum physics/magic), emerge 24 hours later onto the grass of an NFL field. Hell, if a human being could run fast enough and reverse the orbit of the earth to disrupt the space-time continuum and erase a few years of events while retaining the wisdom gained (think Superman saving Lois Lane in the 1978 film), Crowell would lace up those cleats and get to sprinting. It’s what I see as I watch the latest chapter of Crowell’s college career. If I based my evaluation of Crowell’s NFL potential solely on football skill, he is easily the best running back in this 2014 NFL Draft class. But talent isn’t everything. When Isaiah Crowell arrived a Georgia as a freshman, there was talk that the Columbus Georgia native had the kind of talent that folks in Athens Georgia hadn’t seen since Herschel Walker. Much of this hype was on the national level among the more photo-friendly, word-conservative publications covering college football. Walker is the standard-bearer for Georgia running backs and Crowell was a worthy challenger to the crown. A 5-star recruit, Crowell’s 850 yards, and 15 touchdowns as a freshman set the stage for at least two more seasons of big-time college football excellence. In less than a year on campus, he failed a drug test and was charged with two felony counts of illegal possession of a firearm. The charges were later dismissed because there wasn’t sufficient proof that the guns were Crowell’s, but Georgia had seen enough. By spring, Crowell’s career as a Bulldog was over. Two years into his enrollment at Alabama State, Crowell has no off-field issues, attends class, and has often dazzled on the field. A five-star recruit at the running back position should be good enough to transcend the caliber of football around him. But questions about Crowell’s commitment to a team environment linger. Unlike Jadeveon Clowney, Crowell is no longer an SEC star and while it means that the spotlight is far dimmer in the SWAC, the microscope is still just as powerful. Tim Gayle of the Montgomery Advertiser had a revealing interview with Hornets’ head coach Reggie Barlow about Crowell’s tenure with the Alabama State football team. It includes discussion about Crowell removing himself from games after suffering injuries some consider minor and not returning to the field for the rest of those games. “Just talking to the scouts, they’re thinking that what you’ve done over these four years, that’s what you are,” said Barlow, who played in the National Football League for eight seasons. “The money won’t make you do it. The money will make you lazier and make you miss more because you’ve got guaranteed money. If the guy hasn’t done it over the last four years . . . it’s hard to over come it . . . When you’re NFL personnel and you’re investing big money in these young adults, you want to know that, one, he’s going to play to the best of his ability to for as long as he can play and you want to know he’s going to practice to the best of his ability and you want to know that he’s going to be a good teammate and not cause strife . . .
Isaiah has grown up and matured a little bit but he stil as to understand that, on that level, there are only three running backs on a roster. There’s a starter, your change-of-pace back that is typically your punt returner and kickoff return. And your third back plays on all special teams. As someone who has questioned the party line that many draft analysts have taken with Clowney, an underpaid, minimally protected, front-line employee in the big business of college football, one might expect I’d have the same sentiments about Crowell protecting his long-term interests. However, I’m more ambivalent about the Hornets’ star running back. Although he has played through a knee bruise, a sprained left ankle and a swollen foot this season, Crowell’s past transgressions are a huge red flag about the running back’s willingness to be a teammate and not just a star. In this sense, Crowell has generated a potential lose-lose situation when it comes to the draft. He has to be in peak physical condition to perform like a star if he wants to even earn a shot with an NFL team beyond a spring tryout. Yet if he protects himself at the cost of helping his team, then he plays into the selfish, entitled, and immature label that got Crowell into this predicament in the first place. The truth is that I haven’t decided where I stand with Crowell. I believe a young man who was on the cusp of earning everything and lost it all must spend a lot of time thinking about ways to best protect his professional future while at the same time showing his potential employers that he’s worth their consideration. I believe a young man might make the mistake of viewing Alabama State as a weigh station or pit stop along his journey to the NFL when he could have become a major leader on this team and had his team raving about him instead of mixed reviews from his head coach. But I also believe that a young man still has a lot of room for growth and even with the mixed reviews, he’s heading in the right direction. Dez Bryant, Ryan Mathews, and Josh Gordon are three examples front and center into today’s NFL that maturation is a process. As long as the overall trend continues pointing upward, the NFL will invest in talent in need of maturation. I’m the first to tell you that NFL-caliber talents at running back are a dime a dozen, but there’s a difference between an NFL talent and an NFL feature back. Crowell has feature back talent that has been evident since he set foot on Georgia’s campus. His 19-touch, 158-yard, 2-touchdown performance as a freshman against a loaded South Carolina defense that included the likes of Clowney, Melvin Ingram (Chargers), Devin Taylor (Lions), DeVonte Holloman (Cowboys), Stephon Gillmore (Bills), and D.J. Swearinger (Texans), is an impressive testament. Crowell’s first touch in this game is a display of everything that makes him special as a runner. It’s a 15-yard gain on 1st and 10 at the UGA 31 from a 2×1 receiver, 11 personnel set. South Carolina plays a 34 look against Georgia’s zone play to the right. The guards on this play work upfield to the inside linebackers while the rest of the line slants to the right to block the defensive front. The first thing Crowell displays is a terrific link between his eyes and his feet. If you’ve ever wondered what “runs with his eyes,” means, this is a good example. The Georgia running back approaches the line of scrimmage towards the right guard and he sees the nose tackle getting penetration into the backfield. Crowell cuts behind his center and through the gap off the left guard to cross the line of scrimmage and then dips back to the inside towards the right flat so he can work past his tight end’s block on the outside linebacker. There is some excellent change of direction happening on this play and not all of these moves are from dramatic cuts. Much of the best footwork is how well Crowell varies his stride length to maintain good balance through traffic, stay downhill, and set up additional blocks. Crowell takes what could have easily been a gain of 2-3 yards in the direction the blocking intended and makes one early detour that still leads back to the intended path and results in a 15-yard gain. Crowell finishes this run by bouncing outside his tight end’s block and then cuts downhill to work inside his receiver’s block at the 40. He lowers his pads into the safety at the 43, slides under the contact and crosses the 46. Continuous low pad level is one of the things I love about Crowell’s running style, but look how low the safety is on this play. Crowell still manages to get under his opponent’s pads. This is Edgerrin James-like pad level. This 28-yard run from a 2×1 receiver, 11 personnel set is the type of play that will get all but the most jaded football fan to think “that’s a man right there.” The Georgia line slants right as its guards work to the second level to attack the linebackers and one again Crowell has to address penetration into the backfield. The running back takes a step towards the right side of the line at the snap towards the right guard. As he approaches the exchange point with the quarterback, Crowell spots the penetration through right guard working its way to yards into the backfield. Crowell takes the exchange, hops inside the penetration, and cuts downhill at the right hash under the block of his tight end. Then my favorite part. The linebacker screams into the picture and slams into Crowell’s right shoulder at the same time a second defender shoots low from the opposite side. Crowell’s aforementioned stride as a runner gives him the flexibility to duck his shoulder away from the full impact of the hit and at the same time pull his left leg away from the defensive back’s wrap. Crowell emerges from the high-low hit that would end play for most college running backs and gains another six yards for the first down as he crosses the middle of he field to the left hash at the 40. He gains another seven before he encounters the cornerback crossing over top at the 30 in an attempt to cut off the runner’s angle. While navigating this defender, Crowell gets wrapped from behind by the linebacker giving chase and finishes the run diving forward to the South Carolina 31. Watch the rest of this cut-up package of Crowell against South Carolina and you’ll see a runner with a good stiff arm, soft hands as a receiver, and the maturity to grind out the tough yards against a top-notch defense. It’s a performance from a freshman that most seniors with NFL aspirations would envy. It’s tape that also provides credence that what you’re about to see from his Alabama State tape isn’t an illusion. This is a 1st and 10 run early in the first quarter from a 2×2 receiver 10 personnel pistol against a 3-4 look from Jackson State. The line slants right and Crowell takes the exchange towards the center before dipping outside towards the left tackle. Waiting in the hole is an unblocked linebacker. Watch the replay from the end zone angle and note the quickness of the outside-in move paired with a straight-arm to get past the defender in the hole. The best prospects integrate their physical and conceptual skills in a variety of ways and this 14-yard gain is just one example. A vital part of great vision is balancing the qualities of patience and decisiveness. Every back errs on one end of this spectrum, but the best runners have a knack for striking the right balance more times than their peers. This 84-yard touchdown run has other components worth mentioning such as speed, balance, pad level, and second effort, but it’s the decisiveness and commitment to the crease that I value in light of the runs I showed of Crowell where he has to demonstrate more creativity and patience. The Hornets’ runner takes the ball from this 1×3 receiver, 10-personnel shotgun set at the 16 and veers toward the left end. If you freeze the tape at the 54-second mark where Crowell is still a step inside the left hash, there’s a good view of the unblocked linebacker working through the gap. I’ve seen my share of backs who rely too much on their athleticism and try to avoid this defender rather than commit to the intended path. Clinton Portis is a great example of a runner with excellent feet and agility who could commit to a crease even if it appears small and the pursuit is looming. Laurence Maroney could not. Crowell doesn’t hesitate. He beats the linebacker to the crease and hits it hard enough with good pad level to bounce off a hit as he turns down hill and then run through the defensive linebacker four yards down field. Driving through the wrap, Crowell emerges in the open field at the 25, accelerates to top speed at the 35, and maintains his pace the final 65 yards. This play features a second-level cut back that I’ve seen Ryan Mathews, Matt Forte, and Adrian Peterson make in college and the NFL. It’s an 11-personnel pistol set at the Alabama State 34. Not only does Crowell hit this hole with authority, he obliterates the angle of an unblocked safety as he emerges from contact with a defensive lineman. Crowell has to stiff arm the defensive tackle as he hits his crease and still manages to make a hard cut under the safety without losing stride. The footwork, burst, and balance to make this happen is feature back material. It’s the type of 21-yard run one would also witness in a Seahawks contest featuring Marshawn Lynch. I asked football writer and former NFL player Ryan Riddle what it was like trying to tackle Marshawn Lynch, Riddle’s teammate at Cal. Riddle said, “It was like trying to tackle the ocean.” Crowell has a similar quality of energy to his running style – even if those possessing little appreciation for the nuance of analysis will blurt out “but Lynch doesn’t run out of bounds.” Of course, those are the same people who just read this passage and thought I said Ryan Mathews is as good as Adrian Peterson. Crowell has the physical skill and conceptual know-how to develop into a productive feature back in the NFL. He’s the best pure runner in this class. In fact, I think his combination of vision, balance, and burst would have made him a better prospect than any back in the 2013 class. But Crowell isn’t wrapping up his junior year at Georgia with a spotless off-field record. He’s about to learn one way or the other that talent only gets you so far in this world. I hope this time he’s had enough hard lessons to choose the easier ones. For analysis of skill players in this year’s draft class, download the 2013 Rookie Scouting Portfolio. The 2014 RSP will available April 1 and if you pre-order before February 10, you get a 10 percent discount. Better yet, if you’re a fantasy owner the 56-page Post-Draft Add-on comes with the 2012 – 2014 RSPs at no additional charge and available for download within a week after the NFL Draft. Best, yet, 10 percent of every sale is donated to Darkness to Light to combat sexual abuse. You can purchase past editions of the Rookie Scouting Portfolio for just $9.95 apiece.